After starting my career using satellite imagery to study the moons of Jupiter, I transitioned into using satellite and aerial imagery to study Earth. What was I looking at? Landslides. ​In addition to the landslides, I've also studied their affect downstream. The U.S. Pacific Northwest is highly prone to frequent and potentially deadly landslides. Between 1996 and 2016, there were nearly 15,000 recorded landslides in the states of Oregon and Washington, USA. By evaluating landslide patterns at a regional scale, we hope to determine what recent and antecedent rainfall thresholds trigger localized and widespread landsliding. This study uses a newly compiled Pacific Northwest Landslide Inventory (PNLI) drawing from a suite of state and global data and leverages that against 30 years of gridded time series hydrologic data from the National Climate Assessment – Land Data Assimilation Systems (NCA-LDAS). This work evaluates the rainfall triggering relationships across this region in an effort to better characterize the patterns of changing potential landslide frequency over the recent decades. Trend analysis of extreme rainfall days within the study region suggest that since 1980 there has been a slight decreasing rate in the number of extreme rainfall days over the coastal mountains and inland Cascade mountains. However, the majority of landslides triggered within the database result from eight extreme storms within the region, suggesting that it doesn’t take many large many rain events to trigger significant failures. Beaty (1956) first quantified the relation between slope exposure (aspect), the compass direction faced by a hillside normal to its contours, and landsliding in the Bay Area; he found that 78 of 112 recent small landslides east of the city of Oakland occupied NW to NE slopes. Frequency distributions of DEM-calculated aspect revisit this relation for two large sets of landslides in seven 1:24,000 quadrangles centered on Oakland: 30-m source areas of the 1,943 debris flows that formed during the severe 3-5 January 1982 storm (Wieczorek et al., 1988), and 116,360 30-m grid cells on 6714 pre-1970 deep-seated landslides of various types exclusive of debris flows (Nilsen, 1975; Pike et al., 2001). Normalizing each distribution of landslide aspect (in percent, in 10o intervals) by the aspect of all slopes in the study area above 75 m in elevation and steeper than 3o corrects for the excess of NE and SW slopes imparted by the NW-SE grain of local topography. Both resulting distributions are skewed, but in directions that reflect contrasting processes of landsliding. 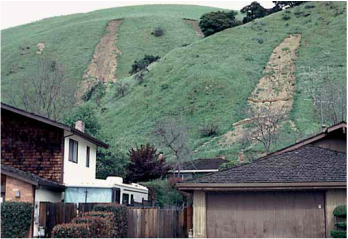 The differences suggest that any incorporation of slope aspect into landslide susceptibility in the Bay area must reflect specific types of failure. The deep-seated landslides favor ENE slopes and are deficient on southerly slopes. The prevailing explanation for this observation was first proposed in the study area by Beaty (1956). Compared to steep S-SW slopes, exposed to afternoon sun at near-normal angles of incidence (northern hemisphere), N-NE slopes are more shaded, sustain less evapo-transpiration, and thus accumulate more and deeper moisture over extended periods-conditions favoring deep-seated failure triggered by prolonged rainfall or seismic shaking. Such conditions are unlikely to have controlled location of the 1982 debris flows, which are conspicuously deficient on NE slopes but strongly favor S-SSE slopes. One explanation is wind-driven rainfall, which may have delivered moisture preferentially to steep southerly slopes. This hypothesis is consistent with the 155o median of 33 hourly measurements of wind direction during the January 1982 rainstorm at nearby Oakland International Airport, where recorded wind speed averaged 19 kts. Alternative explanations and other Bay Area locations remain to be explored. GIS analysis at 30-m resolution reveals that effectiveness of slope-destabilizing processes in the San Francisco Bay area varies with compass direction. Nearly half the soil slip/debris flows mapped after the catastrophic rainstorm of 3–5 January 1982 occurred on slopes that face S to WSW, whereas fewer than one-quarter have a northerly aspect. Azimuthal analysis of hillside properties for susceptible terrain near the city of Oakland suggests that the skewed aspect of these landslides primarily reflects vegetation type, ridge and valley alignment, and storm–wind direction. Bedrock geology, soil expansivity, and terrain height and gradient also were influential but less so; the role of surface curvature is not wholly resolved. Normalising soil-slip aspect by that of the region's NNW-striking topography shifts the modal azimuth of soil-slip aspect from SW to SE, the direction of origin of winds during the 1982 storm—but opposite that of the prevailing WNW winds. Wind from a constant direction increases rainfall on windward slopes while diminishing it on leeward slopes, generating a modelled difference in hydrologically effective rainfall of up to 2:1 on steep hillsides in the Oakland area. This contrast is consistent with numerical simulations of wind-driven rain and with rainfall thresholds for debris-flow activity. We conclude that storm winds from the SE in January 1982 raised the vulnerability of the Bay region's many S-facing hillsides, most of which are covered in shallow-rooted shrub and grass that offer minimal resistance to soil slip. Wind-driven rainfall also appears to have controlled debris-flow location in a major 1998 storm and probably others. Incorporating this overlooked influence into GIS models of debris-flow likelihood would improve predictions of the hazard in central California and elsewhere. In the San Francisco Bay region, either prolonged rainfall or a major earthquake can trigger large, deep-seated landslides, which differ from debris flows and other small, shallow failures. The varying likelihood that hillsides in the Oakland-Berkeley area might incur large landslides is mapped by statistically combining maps of old and recently active landslides with maps of geology and ground slope. Computed as a continuous variable at 30-m resolution, an index of relative susceptibility to deep-seated landsliding is estimated for individual geologic map units as the areal percentage of terrain occupied by old landslides, adjusted by slope gradient and the spatial frequency of recent landslides. The resulting susceptibility map indicates that, although most of the Oakland- Berkeley area is unlikely to host a deep-seated landslide, over one-fifth of the area of residential housing on hillsides has substantial potential for this type of slope instability. 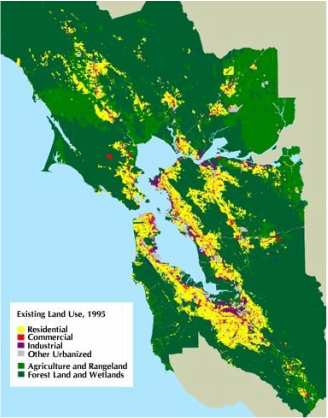 Using similar methods, susceptibility maps could be prepared for the entire San Francisco Bay region or, moreover, anywhere the three components —geology, landslide locations, and slope gradient —are available as digital spatial data. Such susceptibility maps have various applications to public policy aimed at mitigating the landslide hazard. The susceptibility of shallow soil to landsliding by large-magnitude rain storms is estimated for upland hillsides in the Oakland-Berkeley area of northern California, from geographic information system (GIS) analyses of digital elevation models at 5- and 10-m resolution. The regional-scale prediction of source regions for rainfall-induced shallow landslides, which is based on the SHALSTAB model, highlights the topographic influence on initiation sites, which commonly are areas of steep, convergent topography. This broad-scale estimation does not account for such site-specific variability as material properties, vegetation cover, or local hydrologic response; however, on the basis of topographic factors, it does denote the relative spatial density of potential initiation sites, which can mobilize into destructive, fast-moving debris flows. During the second week of November, 2006 a warm, wet air mass, locally called the “Pineapple Express” hit Oregon and Washington and dumped over 50 cm rain onto the volcanoes within 36 hours before there was snow cover. It mobilized the abundant sediment on the slopes of the volcanoes and created many devastating debris flows. The amount of available sediment on the slopes has increased in recent years as glaciers have retreated, exposing the inside of lateral moraines. Mt. Hood was the most devastated with 7 of 11 major drainages producing significant debris flows. Eliot Creek and White River produced extensive debris flows that measured well over 2 million cubic meters each and closed major highways in the region for weeks. A large delta formed in the Columbia River at Hood River resulting from the debris flows. At Mt. Rainier the southwest drainages were hit hard. Kautz Creek rerouted. The Nisqually River enlarged greatly in size and almost undercut the Longmire emergency response headquarters. The Sunshine Campground disappeared. At Mt. St. Helens, the road to Lava Canyon was washed out in two places. Milk Creek was the major debris flow on Mt. Jefferson. On Mt. Adams, many debris flows were generated in the drainages of Salt Creek, Adams Creek and the Big Muddy. The largest debris flow collapsed the moraine at Crofton Ridge. As the climate continues to change, we will see more large debris flows as these air masses arrive before snow cover can shield their impact on the volcanoes. Sobieszczyk, Steven, Uhrich, M.A., Piatt, D.R., and Bragg, H.M., 2008, Analysis of Geomorphic and Hydrologic Characteristics of Mount Jefferson Debris Flow, Oregon, November 6, 2006: U.S. Geological Survey Scientific Investigations Report 2008-5204, 19p. 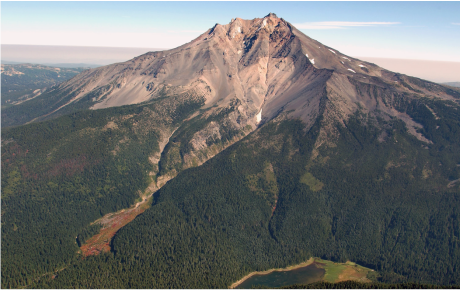 On November 6, 2006, a rocky debris flow surged off the western slopes of Mount Jefferson into the drainage basins of Milk and Pamelia Creeks in Oregon. This debris flow was not a singular event, but rather a series of surges of both debris and flooding throughout the day. The event began during a severe storm that brought warm temperatures and heavy rainfall to the Pacific Northwest. Precipitation measurements near Mount Jefferson at Marion Forks and Santiam Junction showed that more than 16.1 centimeters of precipitation fell the week leading up to the event, including an additional 20.1 centimeters falling during the 2 days afterward. The flooding associated with the debris flow sent an estimated 15,500 to 21,000 metric tons, or 9,800 to 13,000 cubic meters, of suspended sediment downstream, increasing turbidity in the North Santiam River above Detroit Lake to an estimated 35,000 to 55,000 Formazin Nephelometric Units. The debris flow started small as rock and ice calved off an upper valley snowfield, but added volume as it eroded weakly consolidated deposits from previous debris flows, pyroclastic flows, and glacial moraines. Mud run-up markings on trees indicated that the flood stage of this event reached depths of at least 2.4 meters. Velocity calculations indicate that different surges of debris flow and flooding reached 3.9 meters per second. The debris flow reworked and deposited material ranging in size from sand to coarse boulders over a 0.1 square kilometer area, while flooding and scouring as much as 0.45 square kilometer. Based on cross-sectional transect measurements recreating pre-event topography and other field measurements, the total volume of the deposit ranged from 100,000 to 240,000 cubic meters. Landslides are a common geologic feature across much of the western Cascades in Oregon and Washington. The combination of heavy seasonal rainfall, deeply weathered soils, and steep slopes in the region make hillsides highly susceptible to slope failure. Whether landslides materialize as shallow, rapidly moving debris flows, or slow- moving, deep-seated earthflows – landslide activity poses a risk to people and the environment, including increased sediment transport in streams, degradation of aquatic habitat, damage to infrastructure, or even loss of life. Because landslides often flow into mountain valleys, they can quickly supply a large amount of sediment to local streams and rivers. This increased sediment load proves especially problematic for water providers in rivers that serve as the primary source of drinking water for nearby communities because highly turbid water requires costly treatment prior to distribution and consumption. Using water-quality monitoring, it is possible to detect periods of increased turbidity and relate these measurements to landslide source locations. Once a connection is established between a known landslide and a water-quality monitor, instream turbidity then can be used to highlight periods of landslide reactivation and quantify potential erosion rates from the landslide. This methodology has been used in the North Santiam River Basin to monitor changes in sediment input from landslides and determine how land management and climate may alter landslide frequency and magnitude. For example, on November 6, 2006, a large debris flow mobilized from the western slopes of Mount Jefferson into the Milk Creek watershed. The debris flow deposited boulder-sized material over a 0.45 km2 area and sent 15,000 metric tons of suspended sediment downstream. The suspended sediment increased downstream turbidity in the North Santiam River to an estimated peak value of 30,000 Formazin Nephelometric Units. This was the third such event from Mount Jefferson since 2001. Other landslides, such as the Evans Creek Landslide, routinely contribute over 1,000 metric tons of sediment each year to the North Santiam River. Because sediment flux from landslide source areas is not dependent on stream discharge, the turbidity–streamflow relation is much different for landslide sources than that for precipitation-driven surface erosion.